First things first, should you have heard the sudden flurry of news about thousands of bugs infesting your Christmas tree. Not true, not true at all. Stories like this are way overblown. 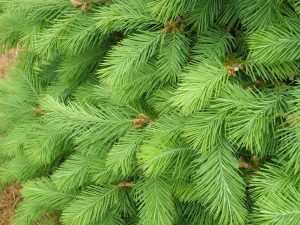 Here in New York, Christmas tree growers use solid IPM practices to deal with pests — and “most insects aren’t hanging around this time of year anyway,” says Elizabeth Lamb, a Christmas tree expert with NYS IPM. Know also that most Christmas tree farms — whether cut-your-own or wholesale — have shakers, special machines that shake bugs to the ground before the trees are sold. 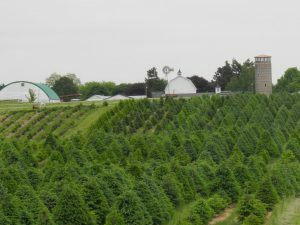 Whether it’s a cut your own or wholesale Christmas tree farm, growers focus on providing happy, healthy trees. Measure your space before you shop so your tree will fit nicely in your home. And don’t put it next to a radiator or furnace vent. Look for a tree with a solid green color — or for some kinds, blue-green. Do you see yellowing needles or slight brown speckles? Be forewarned — its needles might drop early. Choose a tree that fits your needs. Each kind offers its own shape, color, fragrance, and even branch stiffness — important for holding ornaments. Don’t be afraid to handle and bend the branches and shoots. The needles shouldn’t come off in your hands. The shoots should be flexible. If its shoots crack or snap with handling, this is not the tree for you. Do the needles stay on the tree? Are they flexible? Are they fragrant? All these point to a healthy tree. Christmas trees should smell good. Not much fragrance when you flex the needles? The tree might have been cut too long ago. Resist if you can the impulse to bring your tree inside right away. Keeping it outside (on a deck, porch, or even a balcony) in the chill air, its base in a bucket of water, will keep it happy and healthy until you and yours just can’t wait any longer. If you have a small bowsaw, make a fresh cut on the bottom to help it take up water. Trees get thirsty. They can drink as much as a gallon a day. Once your tree is inside, always keep the water in the tree stand topped off. At NYS IPM, we put prevention first by promoting healthy plants. But in this case preventing disappointment — your disappointment — is what we’re about.